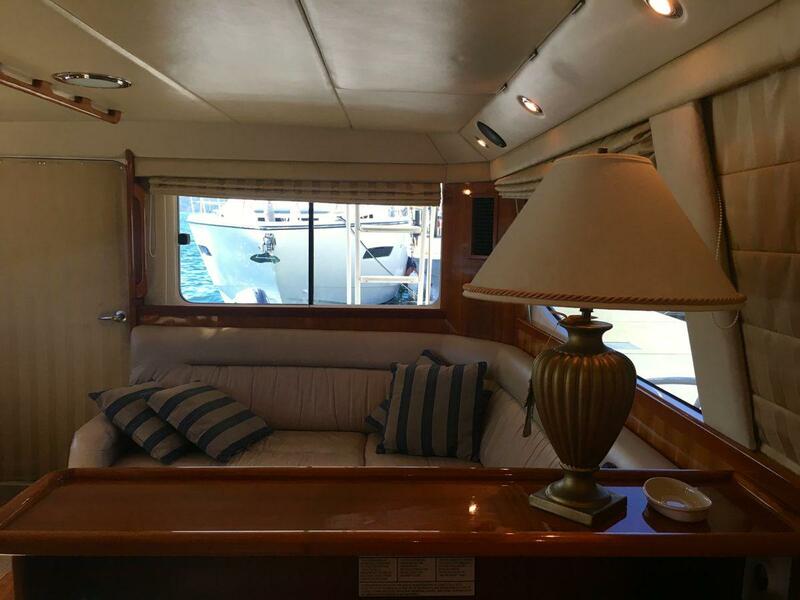 Superb built, luxuriously appointed, powerful and timeless elegance, this 2 owners Riviera 47 2005 combines too many attributes to list. Two owners only with no expense spared to keep her in absolutely pristine condition. 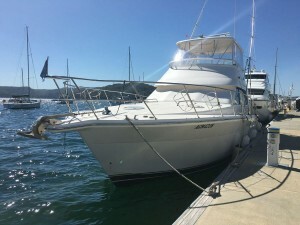 Purchased in the USA in 2012 by her discerning owner as he was not satisfied by was what available on the Australian market at that time, she has every possible upgrade you can think of, including 4 separate air conditioning systems (3 X in cabins and 1 X in flybridge), powerful twin Caterpillars 700HP (as opposed to the regular 535 Cummins), removable marine carpets for flybridge, teak cockpit, and extended swim platform with lifting transom arms for launching the dinghy. 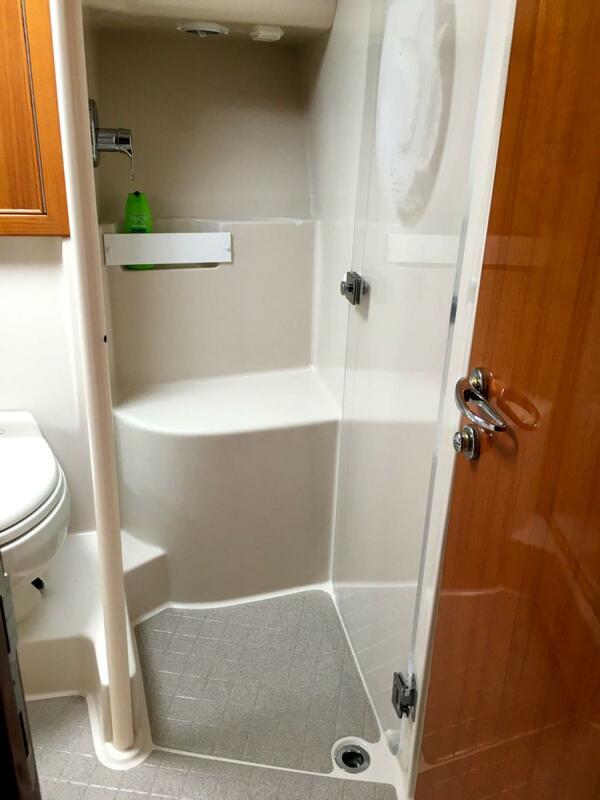 This yacht is the three cabins version, with huge master cabin with island queen berth and full ensuite, and two additional twin cabins with full size single berths in each and ample storage, as well as another guest head and shower area. 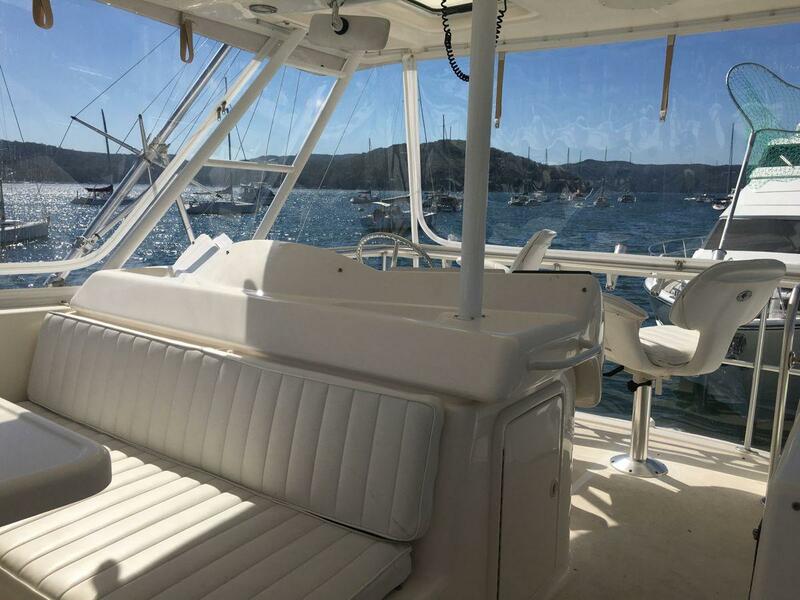 Every new model in Riviera's long and successful 25-year history of building Flybridge Convertible cruisers features refinements and innovations. It's the quiet revolution. Sleek dynamic and elegant but never ostentatious. 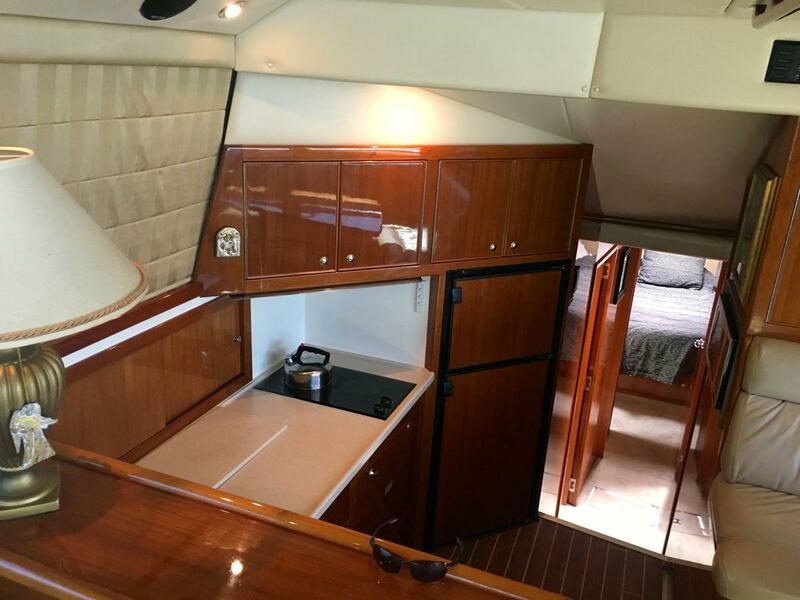 The Riviera 47 is a beautiful expression of Riviera's approach to innovation. It is a marriage of form and function, a development and refinement of an already very successful cruiser. 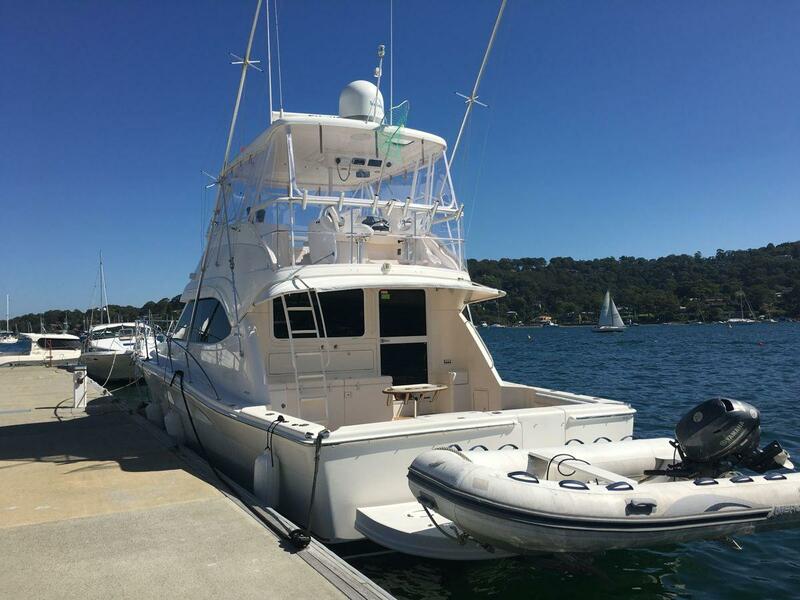 Below the waterline, a revolution in design has been developed by one of the world's leading naval architects, Frank Mulder. He has created a running surface that delivers performance that can only be described as sensational. The most notable feature of this hull is two pockets housing the propeller shafts in the aft section to deliver superior forward thrust, resulting in higher top speed and better fuel economy. 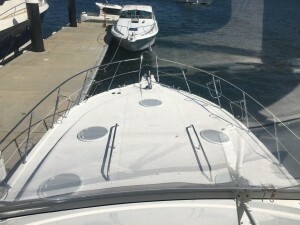 I looked down from the fabulous flybridge on Riviera's new 47-footer at a pod of dolphins dancing off the bow. 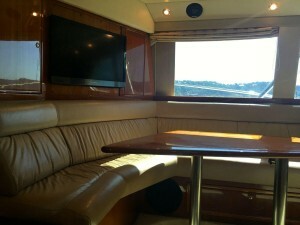 Without question, the giant bridge is where you will find all the action on this summer-savvy convertible. Akin to a rooftop terrace, the bridge has loads of seating, a fridge and sink, and room for at least two couples to cruise with the captain in style. 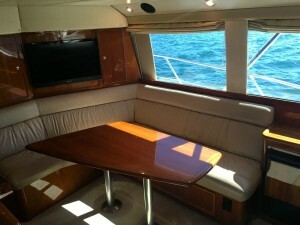 There is even a lunch table for dining on the run, courtesy lights for night cruising, and a remote for the sound system. Designed for outdoor living, the social flybridge will help stop cruiser buyers from shifting into sportscruisers for the sake of a single-level entertaining area. 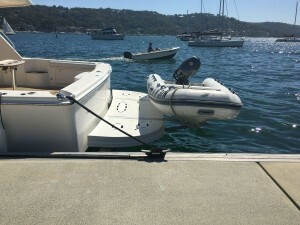 Riviera cruisers are now becoming almost as common in North America and Europe as Sydney Harbour or Southport, where I coasted along the channels, pulled the wheel around to starboard and headed out to sea. 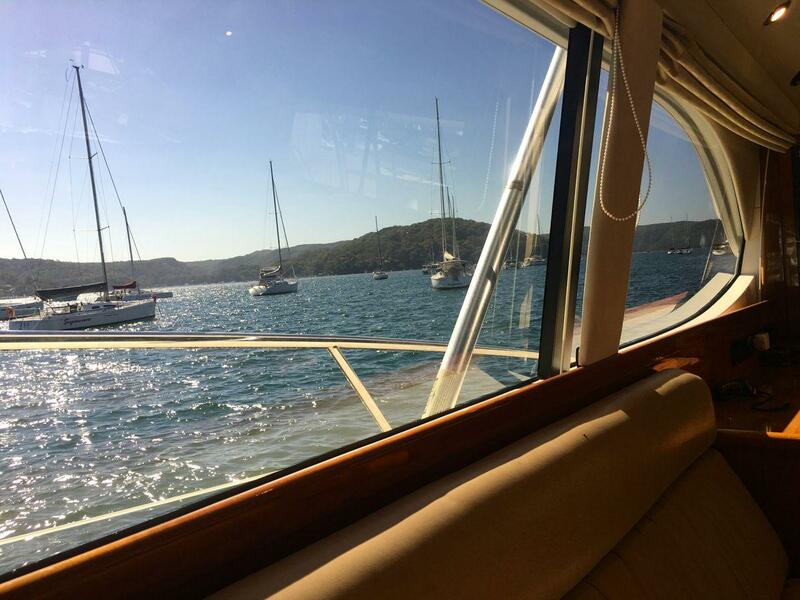 I didn't count on the dolphins dancing off the bow or an ocean so calm I could have cruised all the way to, well, tropical Queensland. But what I did count on was comfort. After all, I have come to expect as much after more than a decade testing Rivieras. 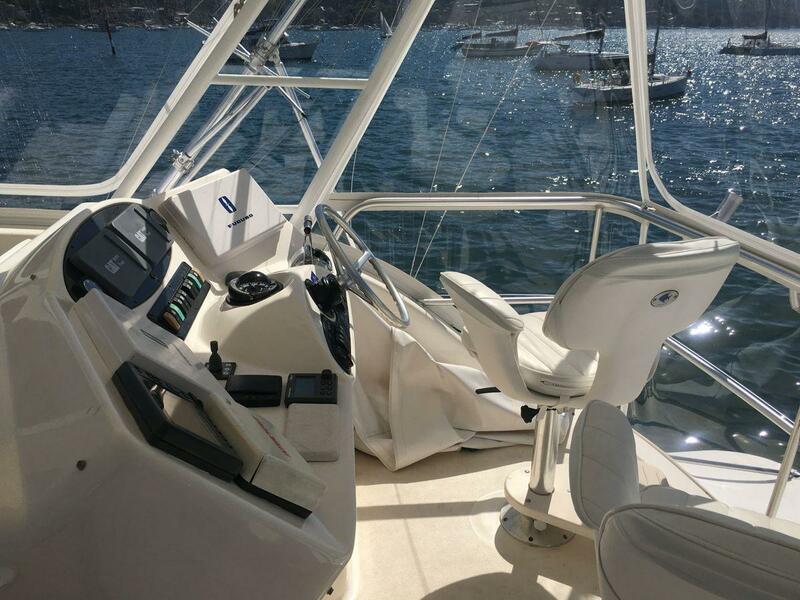 The new 47 is every bit as comfortable as the company's famous 48, which has a fully-enclosed flybridge. But with a hardtop and clears, the new 47 may well be more summer savvy. Covers up, top down, splayed toes on the teak deck... it's that kind of cool conveyance. Americans will consider it a real convertible. 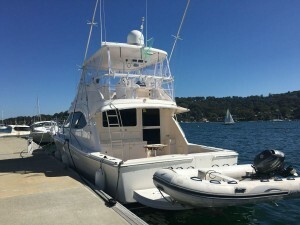 Beneath the styling, there are significant new technological touches and engineering refinements that prove the big boatbuilder isn't prepared to rest on its laurels. 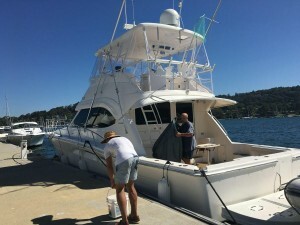 Indeed, every year Riviera seems to build better and better boats - this 47 is one of them. Construction is typically time-proven Riviera stuff comprising solid glass below the waterline and composite decks. The formula must work, as this scribe hasn't heard of a Riviera breaking. 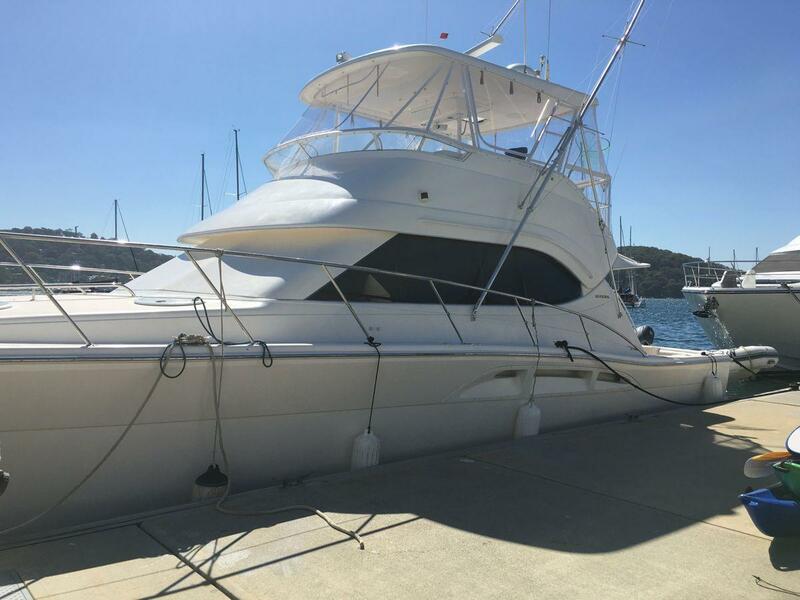 The new 47 has a watertight collision bulkhead and bulkheads front and aft of the engines. Naturally, each compartment has its own auto bilge pump with audio and visual high-water alarms. The fuel tank, under the cockpit floor, carries an impressive 2168lt for a theoretical range of more than 330nm at a racy 22kt cruise. 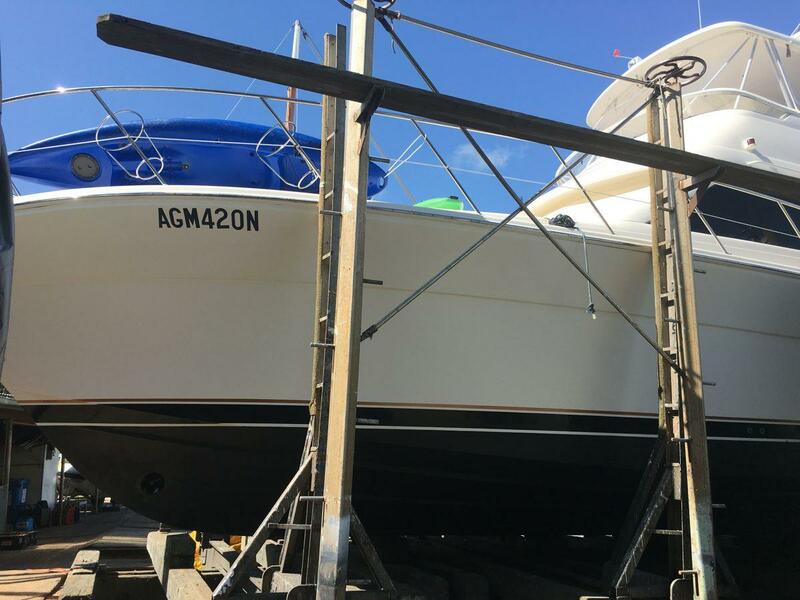 While there was barely a ripple and the new 47 may as well have been on the Med or the Gulf of Mexico during our outing, the hull sure felt slippery. The running surface has a moderate vee and no tunnels, much like the company's 48-footer, but with a bit more flare in the bow and an increased stem angle for a cleaner entry. The boat and its hardy Riviera crew had been given a thorough workout during a tough shakedown cruise from the Gold Coast to the Sydney Boat Show this winter. A 25kt southerly headwind had separated the men from the boys. 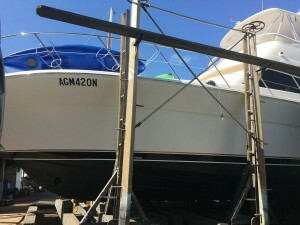 The boat didn't seem at all sloppy or slack as a result. The return trip from Sydney was reportedly quite a contrast, with the 47 maintaining 26-27kt at 2000rpm on flat seas, the same conditions that prevailed during my test drive. 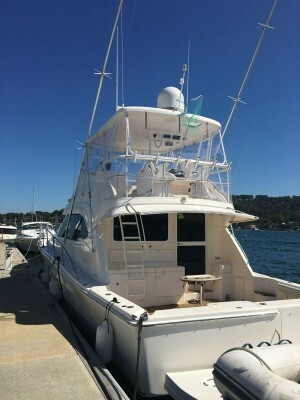 The decks are where you will find the biggest changes between the 47 and the company's tried-and-true 48-footer. 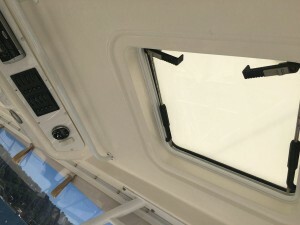 For starters, the transom has a new (inward-opening) central marlin door (no locking mechanism to keep it open) with a raised lip that keeps water out of the cockpit when reversing. The top-mounted deck cleats in the transom corners are customer-driven. While fishers might find they foul lines, crew will love them for their ease of access. 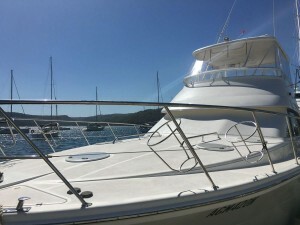 The above-deck cleats make dispatching the mooring lines a snap. 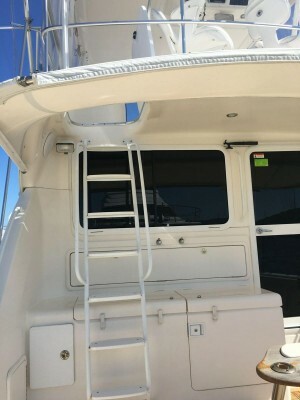 The boat was fitted with optional Reelax rodholders, pop-up cleats for swinging fenders, and deck fillers on both sides of the cabin. A pump for the massive in-transom livebait tank is an option. 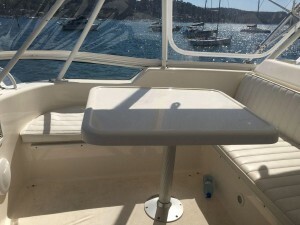 As it is, the tank drains overboard, has a handy lid whose replaceable underside doubles as a cutting board, and enough volume to hold drinks. A big change is the underfloor lazarette. The giant hold has a non-skid liner for attaching D-shackles and tying down long-range provisions. There is room for stowing plastic tubs, dive gear, a duckie, outboard motor, outdoor furniture, spares and more. 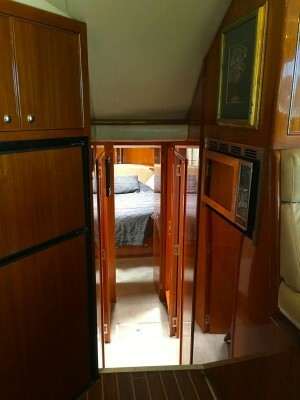 Full marks to Riviera for fitting gas struts to the cockpit hatches. These also have nice big toggles for getting a good hold. 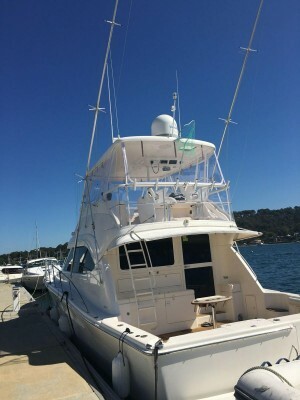 Either side of the lazarette are two additional hatches that, when open, reveal massive in-floor holds that can be used to store fish, bait, dive gear or lines. Storage also exists for ropes in sidepockets and in rear hatches that harbour things like a hot/cold handheld shower and fresh-water hose, raw-water washdown and dock-water connection. To starboard a garbage bin is built in for the empties. 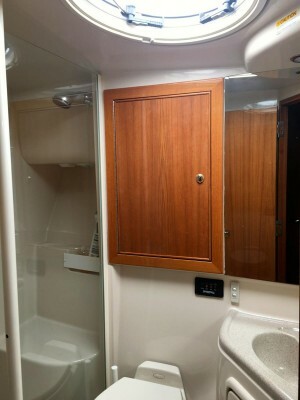 There are cockpit spotlights and a boat hook over the saloon door. A moulded bait fridge/freezer, new deep sink with hot/cold water with Grohe faucet, and tackle locker are fixed against the rear bulkhead. As they are in the shade under the bridge overhang, their lids double as impromptu seats when waiting for some fishing action or idling about the marina. 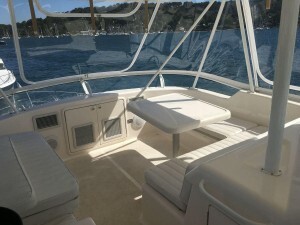 New moulded cockpit steps lead to the boat's wide sidedecks and ultimately the foredeck. There are toerails, a bowrail with an intermediate rail, and grabrails to make the passage safe. 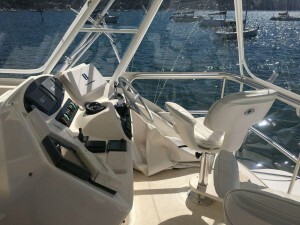 The boat has extra cleats for spring-lines and fenders, and the stainless work is just beautiful. 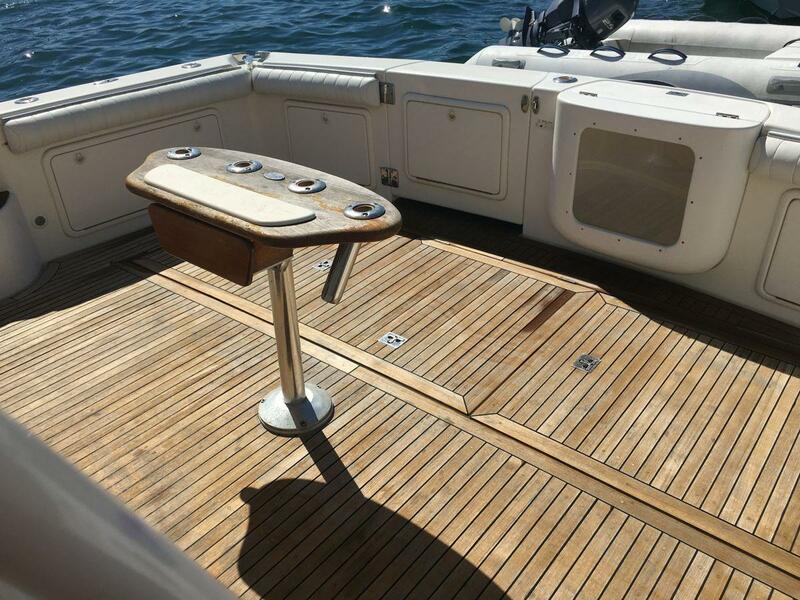 With lots of foot space that is both flat and backed by the bowrail, the foredeck is a useable part of this boat. 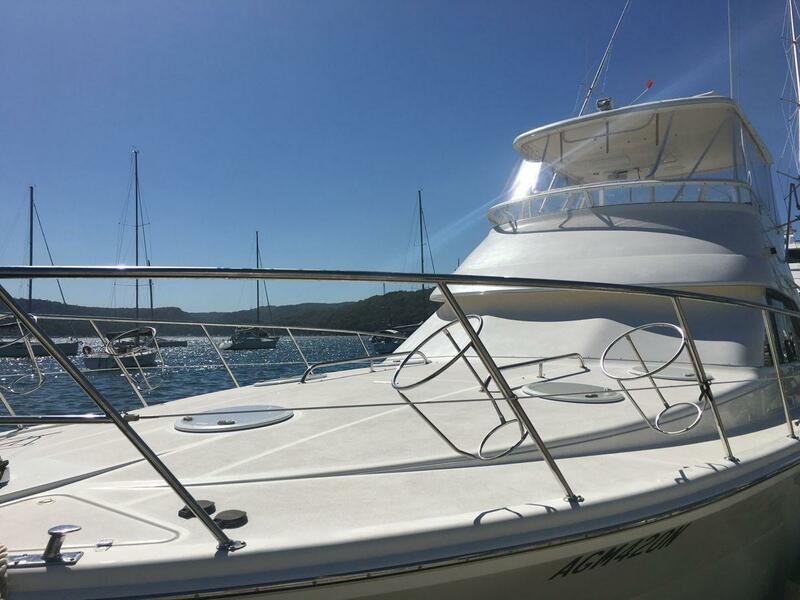 You can sit up there at anchor and take in the fresh air, cast a line or use the bow for dolphin and whale spotting. A terrific eight-step ladder with a nice bit of rake leads through a lockable oval hatch to the bridge. The views are great from every seat in the house. Amenities include a sink with hot/cold water and a fridge set in fair, all-white mouldings. 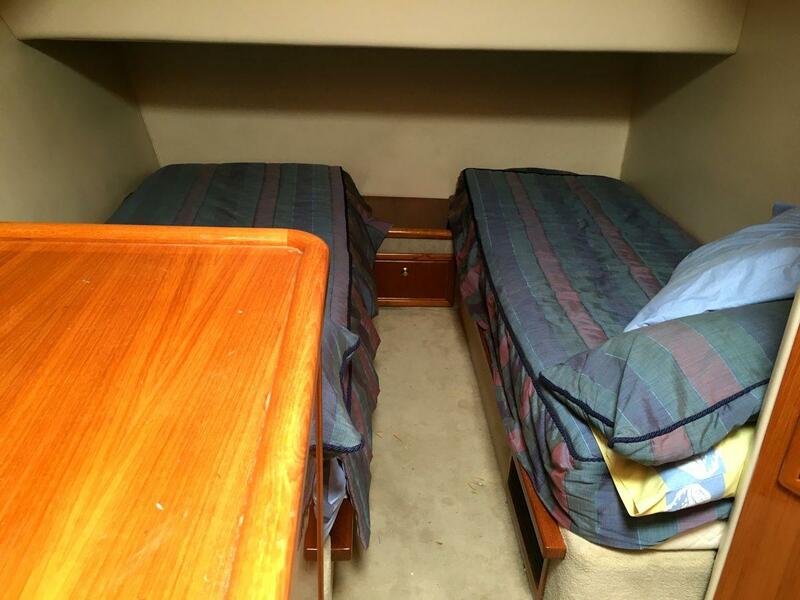 The three-person lounge to port ahead of the skipper can double as a daybed. Four people can sit opposite on a U-shaped lounge. Add director's chairs and you have a lunch setting around a moulded table for up to three couples (subject to loading regulations). 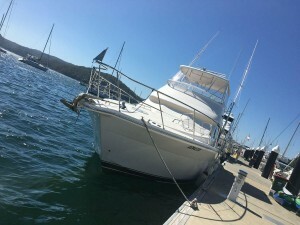 I noted a waterproof speaker, a neat moulded hardtop with a hatch for fresh air, and solid stainless-steel stanchions. 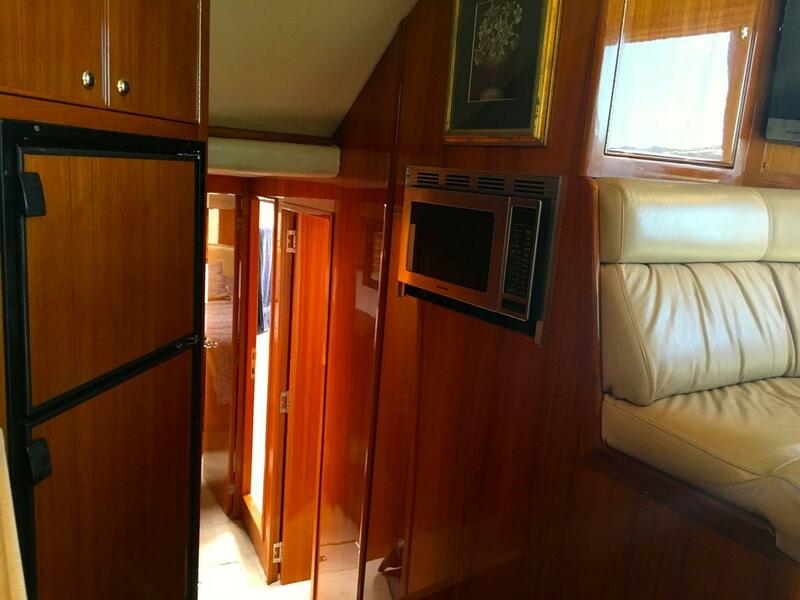 Headroom is more than 1.90m. 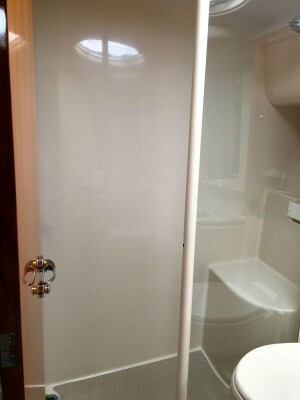 Grabrails are where you need them. Storage exists in the flybridge brow - the perfect spot for lifejackets - and inside the big moulded helm console. There are also spotlights and courtesy lights all over the bridge for night driving. Staggered Pompanette helmseats make this an easy boat to get around. 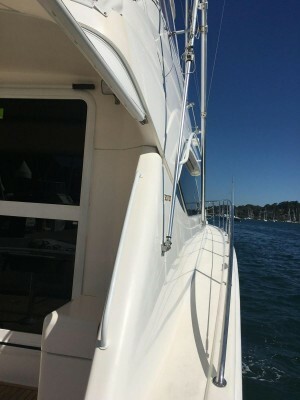 The skipper has good views to the cockpit and the transom edge, even with a rear awning fitted. 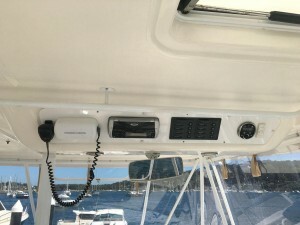 An overhead radio box contains an Icom VHF; twin Cummins LCD displays showing things like fuel consumption, oil pressure, engine temp and so on; plus an indicator panel with alarms for the boat's pumps. 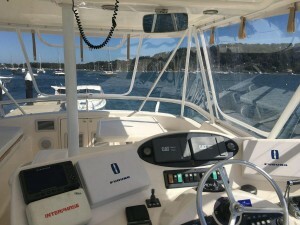 The great big console features carbon-fibre dash panels with cool chrome-rimmed Cummins analogue engine gauges, a Clarion remote, and switch panels for everything from the boat's keyless ignition to engine synchro and trim tabs. 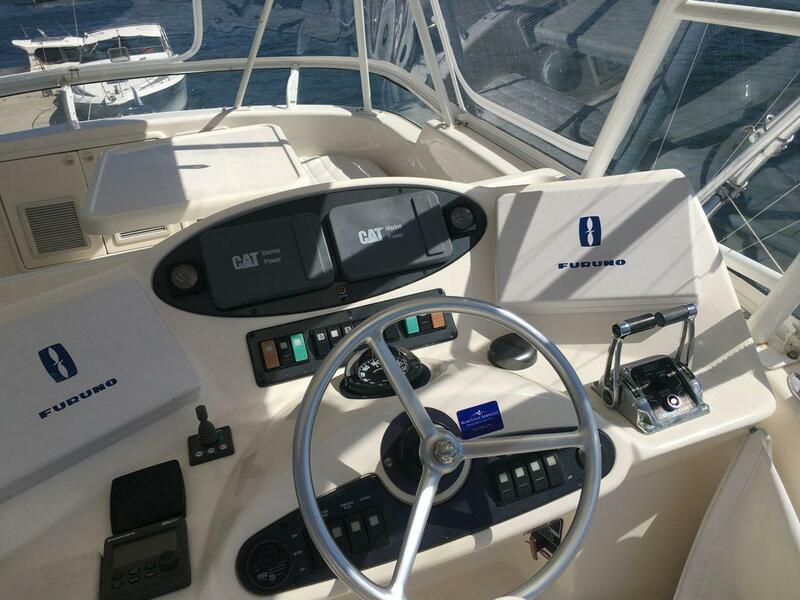 A Sidepower bow thruster and vision to the starboard side of the hull help with close-quarters manoeuvring, as do electronic shifts. For some, the one-second delay will take some getting used to. For others, electronic shifts are the only way to go. 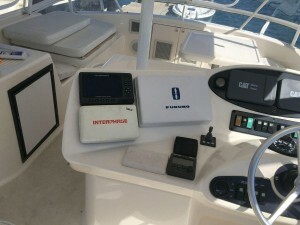 Push-button hands-free boating is available thanks to a Raymarine electronics pack. The boat had radar, GPS plotter and depth sounder in a 10in by 7in flush-mounted screen. There was also an ST6001 autopilot. Access to all the gauges and instruments is via removable dash panels. Riviera has responded to feedback and made the saloon door much wider on the 47 than other models. 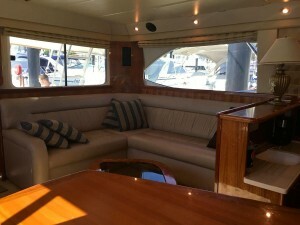 Indoor and outdoor areas of the boat relate better to each other than on other models, too. 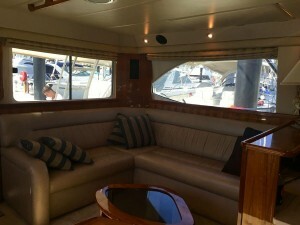 A sliding aft saloon window adds to the flow. Conveniently, the boat's AC/DC panel is beside the saloon door. Undercover floor space is sufficient to entertain a dozen guests if need be. Air-conditioning will keep everyone cool, while surrounding tinted windows with Roman blinds provide privacy at the marina. 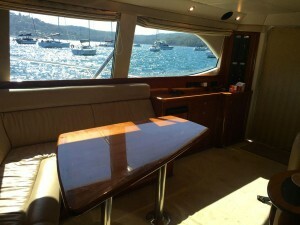 The high-gloss teak joinery adds a salty touch to the styling. This boat had a factory-supplied decor pack with an Egyptian theme. There were statues, elephant prints on scatter cushions, and bone-coloured leather lounges. The starboard side of the saloon is taken up by a teak cabinet containing separate isolators for the air-conditioning units and, get this, switches for the hydraulically activated overhead ceiling lockers. 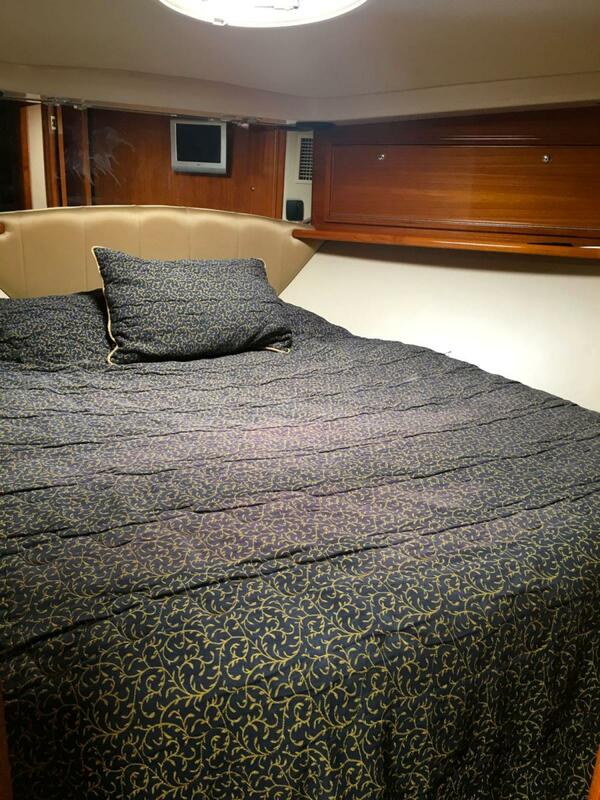 These are the perfect spot for stowing fishing rods, extra cushions, pillows and doonas when that catnap strikes. Seating comes via a five-person L-shaped lounge/daybed to port, set around a coffee table and a dinette that seats four to six people around a great big teak table opposite the galley. 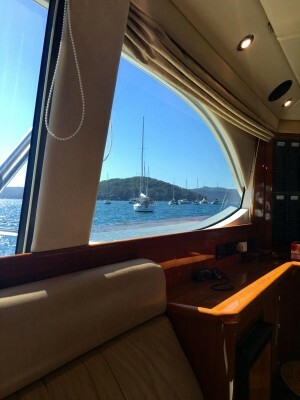 You can enjoy views as you dine. 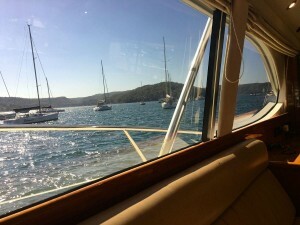 Set behind the windscreen to starboard is the boat's entertainment centre. 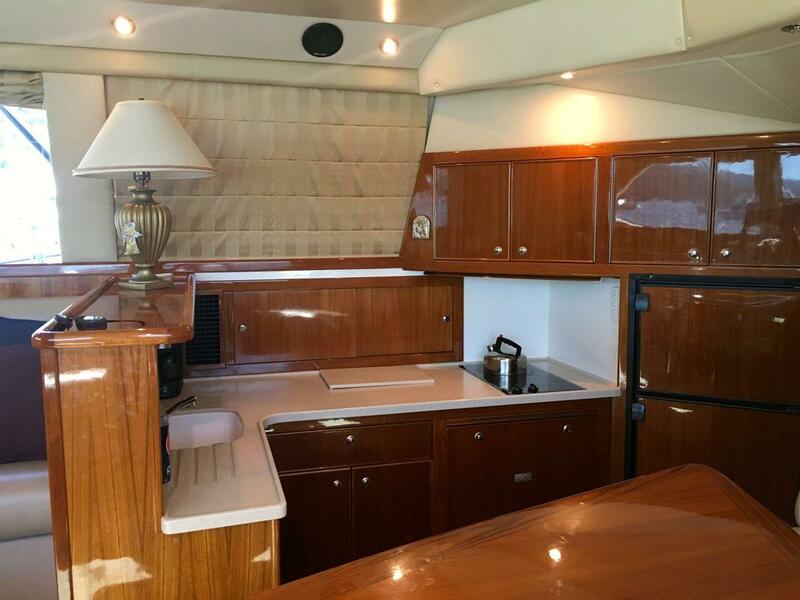 This 47 had a Sony surround-sound system with DVD/CD and VCR, a big television screen, CD locker, and overhead digital depth sounder and pump alert panel. 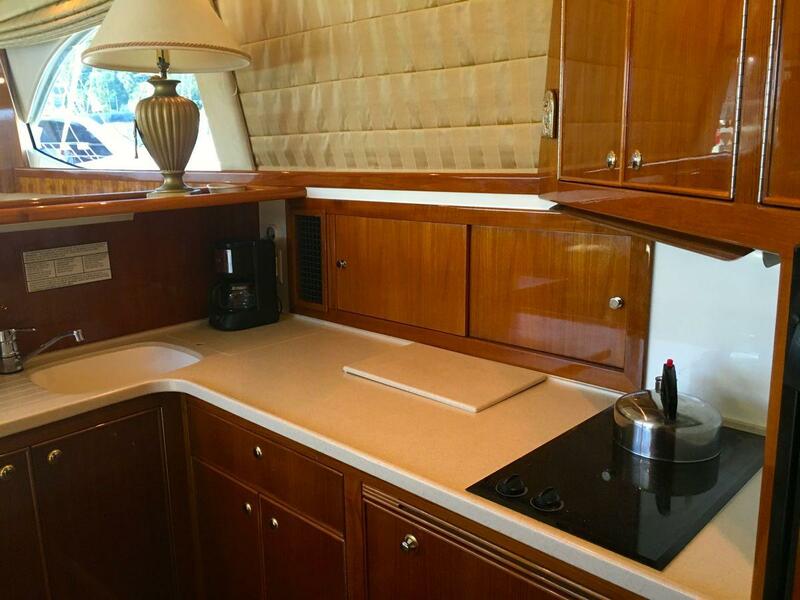 The galley floor, down two steps to port and topped in mock teak and holly timber, hides behind a teak servery that doesn't preclude conversation with guests while you prepare meals. 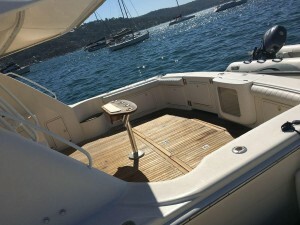 There is an underfloor storage hold for serious long-term provisions, loads of teak cupboards and drawers, and sand-coloured Granicoat benchtops. 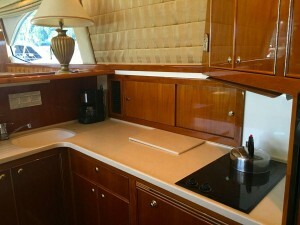 Amenities include a moulded sink with Grohe fittings, a top-loading receptacle, good-sized Tundra fridge with overhead freezer, Fisher & Paykel dishwasher, two-burner ceramic hob (in need of fiddle rails but with an extractor fan) and a high-tech LG convection microwave. 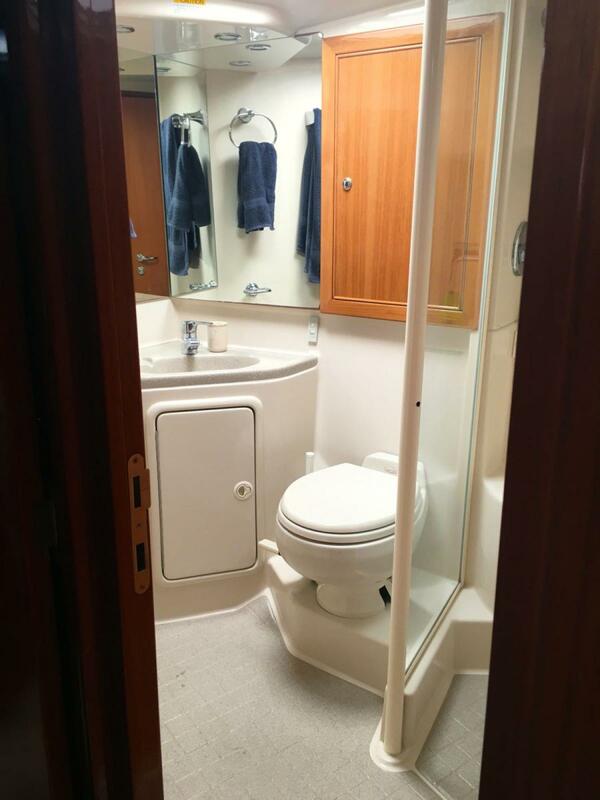 A high-gloss teak-lined companionway, almost ship-like in size, leads down a further three steps to the three cabins and two bathrooms. Despite the generous use of teak, which is rare these days, lots of warm light floods inside. 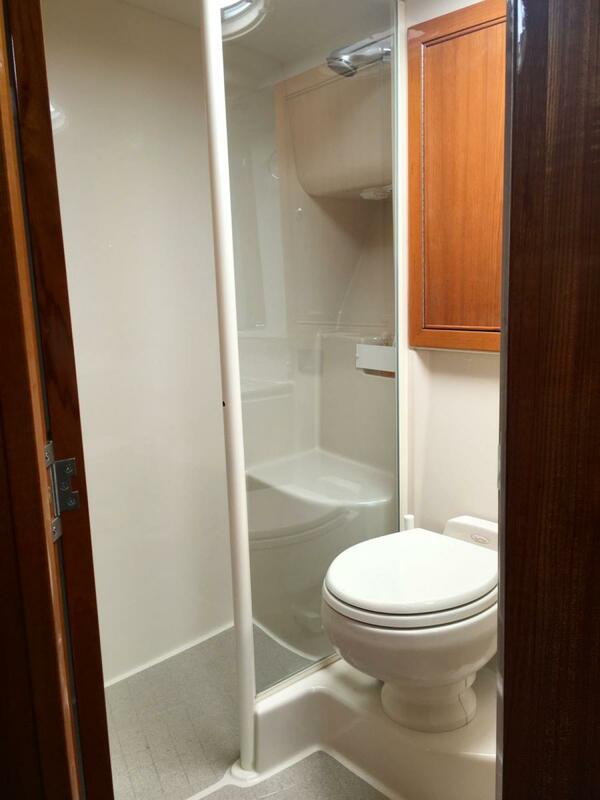 All the cabins boast some form of storage for clobber. They also have cool chrome reading lights, designer bedding, air-conditioning controls and/or opening hatches for fresh air, and lovely teak doors with double-toothed rattle-free catches. Riviera is getting better at the details all the time. 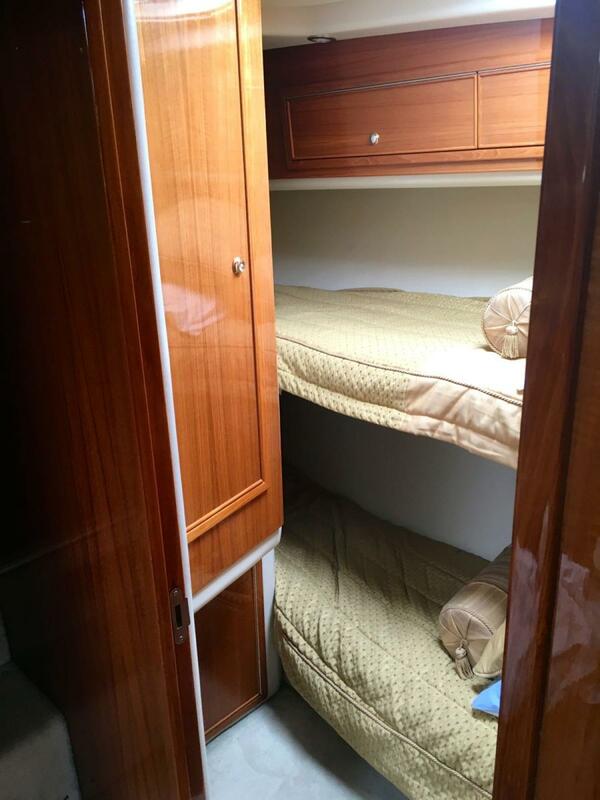 The smallest cabin is immediately to port and harbours two bunks that are surprisingly long, wide and adult-friendly. 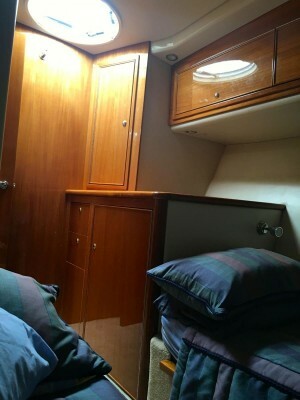 Two overhead cupboards, lockers at the foot of the bed and a teak hanging locker with a light take care of clothing. This cabin also has an optional Thor washer/dryer. Either of the two remaining cabins can be used as the master cabin. 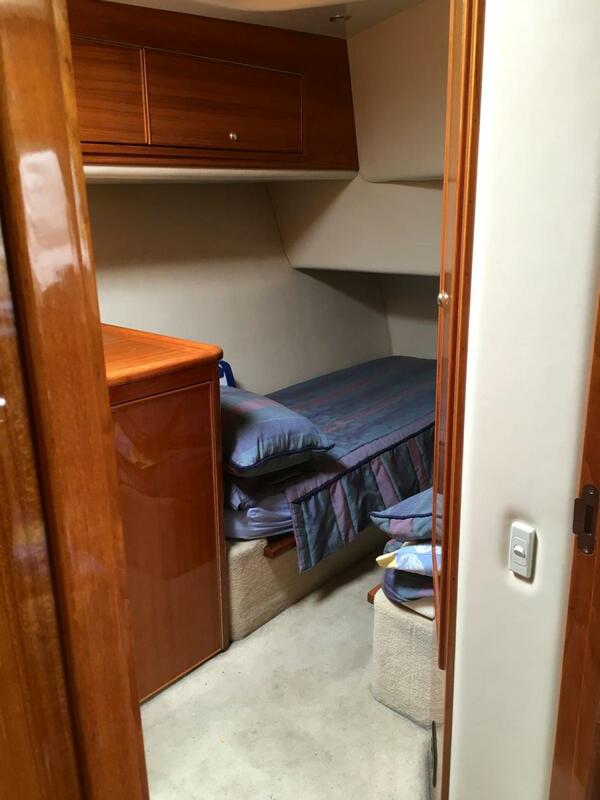 The cabin amidships to port has loads of floor space and an almost apartment-like feel. 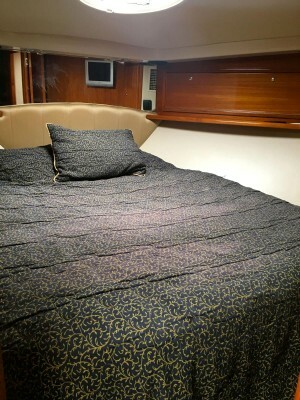 There is a giant king-sized mattress on the floor that might serve big people better than any other bed on the boat. 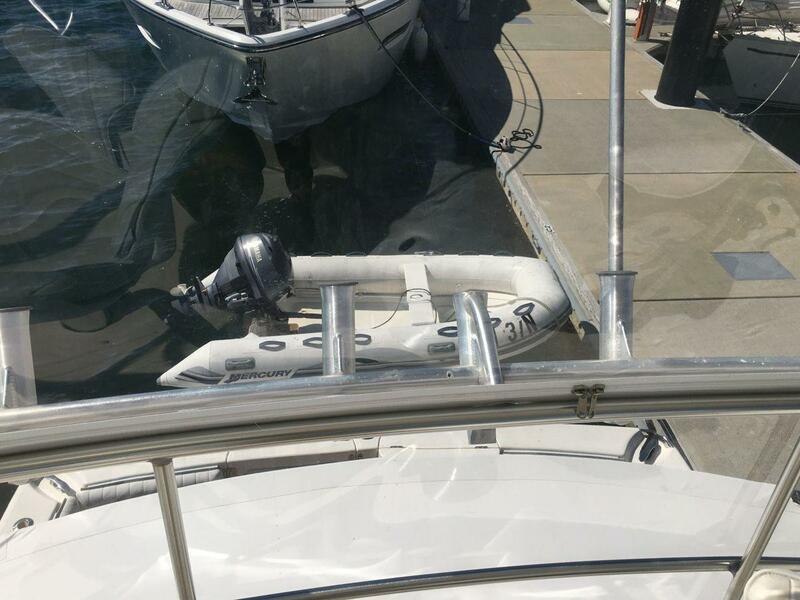 (Please note this boat has the twin single version). The amidships cabin also has a small dresser with mirror, a hanging locker and cupboards. 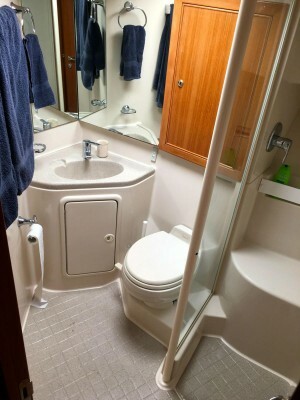 As with most Rivieras, the hotel-like guest bathroom is a beauty. In fact, the 47's dayhead is said to be bigger than its equivalent on the 48. 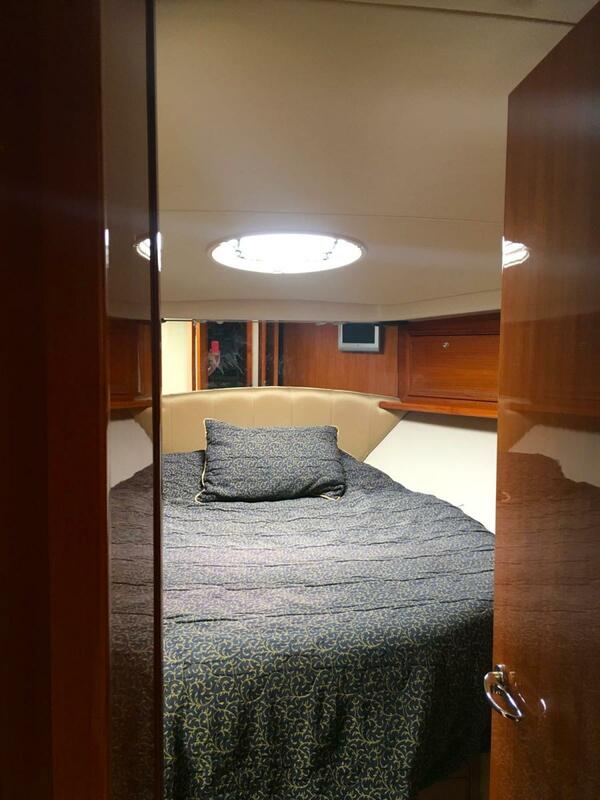 The big, easy-clean moulded space has room to dress, a separate shower stall, Vacuflush loo, timber-framed lockers and moulded vanity. The bow cabin gets Riviera's traditional island berth flanked by hanging lockers, floor space at the foot of the bed for dressing, lots of lockers, and a stylish mirror-backed bedhead with blue Ultrasuede surrounds. There is a separate Sharp flat-screen television with DVD. Price Base : $590,000 Neg.